f you want a lens that looks more like a spaceship’s laser weapon, today is your lucky day. 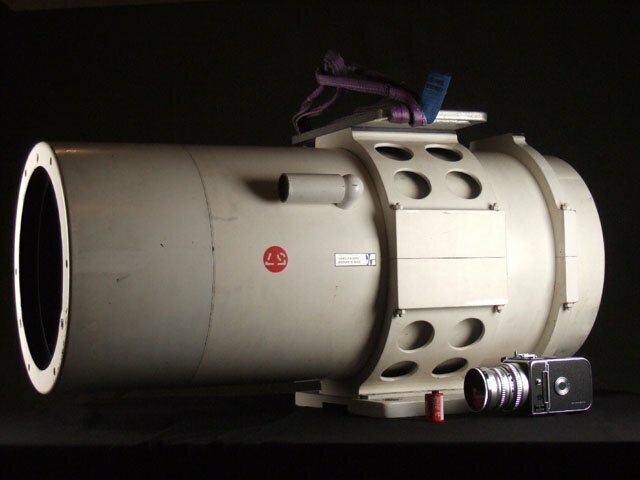 A ginormous NASA 2540mm f/8 mirror tele lens has appeared on eBay in the “film cameras” category. Called the Jonel 100, it’s being touted as “one of the biggest lenses ever,” by the seller. The auction’s description states that NASA used this lens to keep its eye on rockets such as the Saturn V, and that a similar lens was used to track and capture images of the Space Shuttle Challenger on the day it exploded during launch. The listing also enigmatically states that the original price paid for this lens was “a family home.” In some of the product photos included in the listing, a Hasselblad medium format camera is placed next to the lens to give a sense of scale. The lens features a Schmidt-Cassegrain telescope design that produces a 57x57mm image through the 8.5-inch opening on the rear end. You’ll need a bit of help if you’d like to use this lens for your photography, as the thing weighs a staggering 180 pounds — there will be no handheld photography with this piece of equipment. 2540mm is the focal length, the aperture diameter is 12.5 inches. The opening on the rear is about 800mm, not 8.5 inches. But it’s sold now. These are good for tracking missiles and rockets, but terribly heavy and expensive for astronomy.